The third edition of this coursebook has been comprehensively updated to cover the Integrated Science syllabus, first examined in 2011. 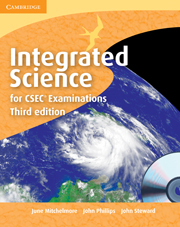 This is the third edition of our previously titled CXC Integrated Science. The content has been comprehensively updated to cover the Caribbean Examination Council’s Integrated Science syllabus, first examined in 2011. Comprehensively covering the CSEC® syllabus requirements, this full-colour edition contains carefully controlled language to make the text accessible for a wide ability range; a variety of activities and examples with specific relevance to the Caribbean. New or improved features include photocopiable worksheets for over 30 SBA practicals; interesting facts in ‘Did you know?’ features and a free CD-ROM, with questions, animations, selected answers for students, and teacher’s notes.